In this post I’m going to take you through the steps involved in performing a DD-WRT Firmware Upgrade on a typical Home Router. I’ll describe the process which I went through myself, when I replaced factory software with free yet powerful DD WRT firmware on my TP-Link WDR3600. So what is DD-WRT and why would you want to take such a drastic step in flashing the Firmware on your Home Router? Setting up port forwarding on router is a must if you using a home server that also acts a download station with apps such as CouchPotato, SickBeard, Transmission, etc. Having a high performing router will definitely enhance your connected-home / media-serving experience. A great router firmware can make a decent router a great router. Let’s find out more. What is a DD-WRT Firmware Upgrade? What features are available with a DD-WRT Firmware? Many home routers run similar chipsets and the firmware running on them is often Linux based. This means that the factory firmware can be replaced with another Linux based firmware package if desired. A DD WRT firmware is a free, open-source alternative for home routers, often providing many more features than what the manufacturers firmware offers out of the box, and is a very stable solution. Lots of these features can certainly enhance the capabilities of your home network. You can do some other pretty cool things with a DD-WRT Firmware upgrade, like breathing new life into an old home router by turning it into an access point, or configuring your home router to log on automatically to a VPN provider, eliminating the need to run VPN client software. In a HTPC environment, you can use the Quality of Service (QoS) feature to prioritize network traffic for your HTPC. [Read: 5 Most common NAS or Home Server uses]. Watch for future posts where we’ll demonstrate how to use some of these specific functions with DD-WRT. Do be warned, there is an element of risk attached to flashing your routers firmware. If done incorrectly, you can potentially break your router. The key to success is to research beforehand. Check on the DD-WRT router database that your router is supported, and read the DD-WRT Wiki. If you have an old home router laying around which is supported for a DD-WRT firmware upgrade, then try it out with that router first and familiarize yourself with the process. Do bear in mind that the procedure in this article is specifically tailored for a TP-Link WDR3600. The overall procedure may be similar, there may be some critical differences, so please do your research! The first download is what you’ll need to start the upgrade process off with. You'll have to flash routers with this firmware version initially to convert from the manufacturer’s firmware to DD-WRT. The second download will allow you to go back to the manufacturer’s firmware if you want to do so at a later date. The third download is a more up to date version of DD-WRT as shown in the “Supported by” dropdown. I would advise downloading all three files listed. Additionally, I would also recommend having a good look through the Forums. In my case, I downloaded a newer firmware than the webflash one listed, as there were known performance problems with the one listed in the router database. It’s worth posting a simple question on the forum, asking what the current recommended firmware release is for your router. Please take your time to research this, in order to help you avoid breaking your router! So without further ado, let's see how to flash DD-WRT on your router. Make sure you’re connected to your router with an Ethernet cable. Do not attempt any work of this nature over a wireless connection. When I’m doing this sort of thing, I tend to use an old Laptop to do the configuring, and plug it in directly to a spare Ethernet port on the router. Make sure you can access the routers web interface. On the TP-Link, the default IP Address is 192.168.0.1, so in your browser enter http://192.168.0.1 and you should get to the routers home page. Take a Backup. This is a no-brainer; you’ll want to back up your existing router configuration, in case you want to recover the settings in the event that you decide to revert to the stock firmware. Depending on your router, the backup option will be in different places in the software menu. On the TP-Link, it can be found under System Tools -> Backup and Restore. Save the generated backup file somewhere safe. 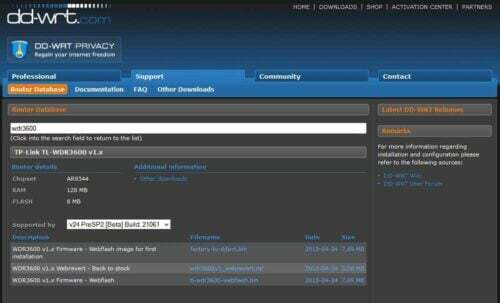 Install the DD-WRT Initial Webflash image through the standard interface. On the TP-Link, you’ll need to go into System Tools -> Firmware Upgrade. Browse to the first Webflash file which you downloaded earlier and click the Upgrade button. Ensure that you do not power off or reset the router during this process, as this could break your router! This process will take a few minutes. After the upgrade reaches 100%, wait at least 2 minutes before proceeding with the next step. This step requires careful attention, read carefully! We’re going to perform what’s commonly referred to as a 30/30/30 reset of the router. Hold down the router’s reset button and don’t release it. After 30 seconds, while still holding the button down, pull the power cable out of the back of the router. Still with the button held down, wait another 30 seconds. Now, still with the button held down, plug the power cable back in and wait another 30 seconds. Now you must unplug the power again, and at this point you can finally release the reset button! Wait at least 2 minutes. If you’re in any doubt as to whether or not you performed step 5 correctly, you can repeat step 5 if you like. Now for good measure, disconnect the power from the router for 30 seconds, and plug it back in again. 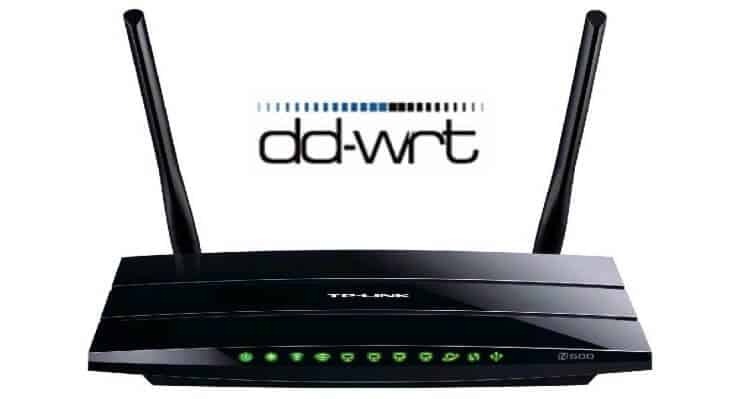 Once the router has restarted, you may well lose connection with it, as the default IP Address of DD-WRT is different to that of the TP-Link Firmware. The easiest way around this is to reboot your client PC so that it picks up a new IP Address from the router. Once you have done this, you should be able to navigate to the browser interface on the router, which will now be http://192.168.1.1. If all goes well, you should now see the DD-WRT Browser interface for the router. When you navigate through the interface, you will need to logon to the router. The default DD-WRT username is root and the default password is admin. With the router now restarted, you should perform the 30/30/30 reset of the router once again as described in step 5. Although things may look good by now, DD-WRT recommend that a 30/30/30 reset is done before and after any router upgrade. If you’ve followed these instructions carefully, you should now have new life breathed into your home router with a DD-WRT Firmware upgrade! You can proceed to navigate through the user friendly browser interface and configure it to your liking. For those not brave enough to attempt a DD-WRT firmware upgrade, there are some Buffalo Routers available which come with DD-WRT pre-installed. There are also some companies out there which sell various off-the-shelf routers which they have already flashed with a DD-WRT firmware upgrade. 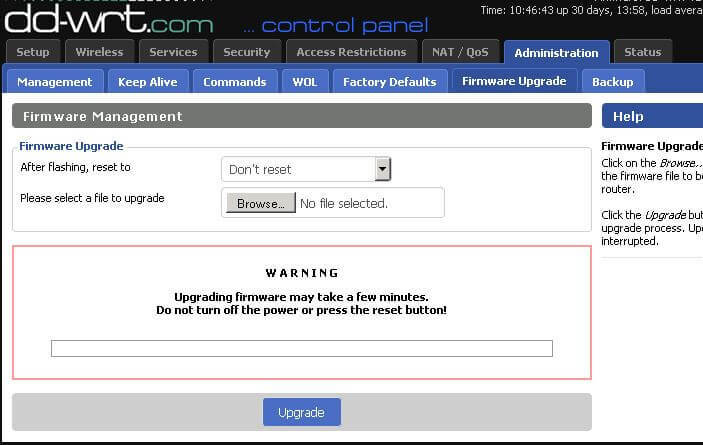 While not as cheap an option as a DIY upgrade, this is a safer alternative if you’re uncomfortable with flashing your Home router by following the DD-WRT firmware upgrade procedure.